The Exchange Deployment assistance will generate a guide for you. Just go through the steps. That last one requires an email address to get but it looks like it may be useful. So I hope I captured the mission of this blog With the title. I was trying to update some firmware and drivers over a DRAC/ILO. I found it was quite hard to find a way to wrap your BIOS and CHIP-SET into an ISO file unless that ISO was going to be the size of a Full Van Halen Double DVD! Or worse, I was burning a Default of 6 Terra Bytes or something! Figure 1. How to make a Small ISO file for your Small Files. So I did the experimenting and I am going to introduce you to something you may not have heard of. Mebibytes! That’s Mee — BIB— EYETS!! That is not a unit of weight is it? It turns out this is a unit of Data. So you just have to fool around with getting the right amount of Mee Bee Bites. and your ISO can be whatever size you want!!. So My research suggest you wont find anything for Free around unless you use IMGBURN. Great! Its got a lot of press online, they say it works but they never told me about the MEE BEE BITES! So Grab your version of IMGBURN and follow me to BIOS ISLAND!! So Below You will find the basic steps for how to do this magic. I suspect there will be a video at the top of this Blog that may not be more entertaining, but will be of some help if the instructions don’t make sense. 2. Set the Profile to Custom. 3. Secret sauce (see screen shot below) Arrows show a sectors to Mebebytes. Convert the number to the right to Megabytes or Gigabytes. MiB is mebibytes- so the conversion to search google is mebibytes to megabytes. once you know how many megabytes you want the ISO to be, just keep increasing the numbers until the conversion comes up to what you want for the iSO size. I can help you in just a few minutes. One negative, the first installer had an adware, you just decline it, then you will get a second installer, which is the actual app, no adware, at all, just delete the first EXE and run the second one. So There is not much to it, but I think watching it happen will make it much easier to carry out. I will put the video up top and make it short for you all. I hope this is helpful!!. In the video I covered two additional subjects. I explained how to make the Image Bootable in ImgBurn. 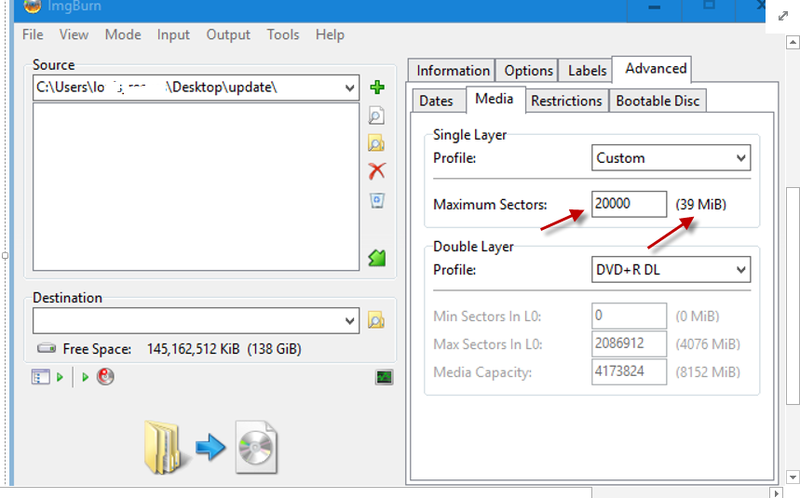 I also showed a link for how to make a bootable USB with an application named RUFUS. I did not explain that process, but I did show the link to the RUFUS USB Bootable Blog Post. I hope you left this blog post with what you came here looking for! Have a great day and weekend! If you need to remember screen shots for burning of ImgBurn, so the ISO becomes bootable, Have a look at this blog entitled “How To Create Bootable Windows 10/8.1/7 ISO From Files/Folders”. This set of screen shots can supplement the Video and this blog, with screenshots and steps to make a bootable image very possible for all. . I wrote a blog the other night, about renaming your Skype for Business Pool. The joke of the article was you basically have to decommission the server!! The more I got to thinking about the changes in SFB, the more I got to realize the Skype Team is moving in the direction of the Exchange Team as far as decommissioning goes. Truly, if you expect to be able to use your server for a subsequent deployment, your going to have to get all the metadata cleaned up. In order to do this, you really need a good comprehensive removal process. This is a shot at one anyway. Please comment if you come up with a situation where your not satisfied with my removal steps. I will adjust to make them as comprehensive as I can. Thank you in Advance. Once you get to this point, you may Remove gateways from topology. But before you do, that means disassociating them from routes etc. in SFB Control Panel. Go to Voice Routing. and the other tabs, and remove the gateway where ever it may appear. Then then delete it in topology builder. Uninstall Databases -There may be several of these commands, depending on what you have installed. See for database type below- you may have all these- so just keep runing them until you have the databases all removed! Now your databases are gone, so you can disconnect the CMS store from the Deployment. You may have to play with the syntax on the last few commands, to get the final steps correct. Don’t be shy. You have the structure, you just need to get the commands to be specific for you now. Good luck and I hope this was of some help. I suppose the last step is to go into programs and features and remove all the lync applications. This should complete your removal. The final final step is to go into the ADSIedit and choose to login to the configuration partition. You should choose services and then highlight the RTC Service. Right click and Delete it and all its contents. Let me begin by saying this Blog looks really boring to read. I am adding a Picture to the top so it looks more fun. I know it wont make it any more fun, but at least I feel like a better writer somehow. This is a picture of a Tea Cup Pit Bull! Yes they do have those. 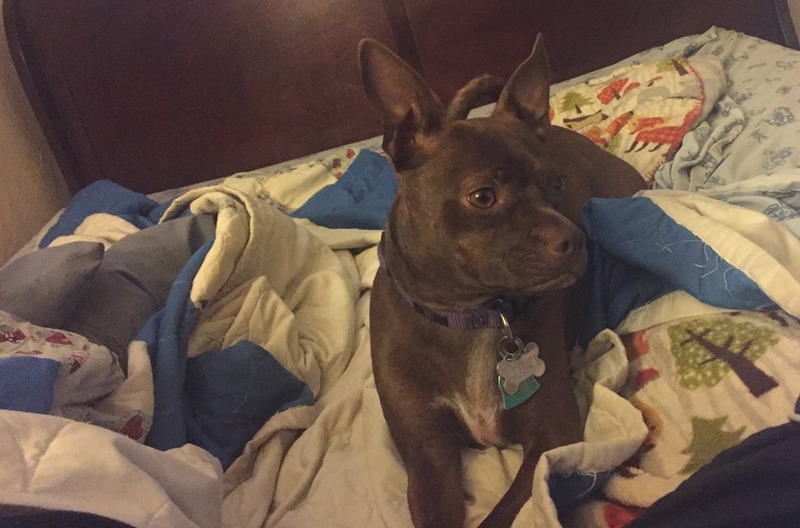 Let me tell you, She is mean as can be as long as she stays near a Blanket ! Back to SFB- Address Books is it broken-> Lets see. I have been troubleshooting some Lync address book failures this week. I thought I would sit down and write down some of the basic troubleshooting I do to isolate a potential problem. This post assumes you are not running UCS, but It may still be helpful. I would remove UCS for troubleshooting if your having Address Book Problems anyway. 1. Is text in the address book corrupt in some way? If yes, I have seen this issue occur only when UCS had been partially or fully Deployed. Then a migration occurred. If the UCS (unified contact store) had been deployed and you then migrated exchange or Lync Server, your best bet is to do a UCS rollback for Lync. Next Update your Lync Clients, so they are all current, to the version of Server CU. Next, redeploy UCS if your issue is not resolved. Now you will need to wait 24 hours or so for the corruption to be cleaned up. You may also not be aware there are two mechanisms for the address book. One uses a file cache. The other users a live web search. You can use one at a time, or you can use both. The default is to use both. Here is how to force the use of only the web look up. This will tell you if the web look up is working. What your going to do is run the following command. Once this is done, perform your update CS commands and wait. This may take a little bit for the policy to filter down. You can change the command back, but this will take a while to switch, either way. There is an unusual circumstance where contacts will not update if they are not in the correct Domains list. More on this in another article. To conclude, there is a lot here in just troubleshooting the Address Book Update. This is by no means an exhaustive document. However, It does give you a place to start, and hopefully with these commands I have used for a while now, you will get a foothold into the failure, and you may be able to get down to a possible solution. In closing I will add that the Address Book service itself is not usually a problem. The one issue I run into over and over again was from Lync 2013 Updates, around the time SFB came out. There was a patch in there, where the update caused web services a bad time In IIS. The advice is just to make sure you are up to date on your Lync 2013 Updates. Also Skype for Business should not be RTM at this point. SFB needs to be at the current CU, and you should not have any issues, with the Address Book. This also means update your Client!! This little nugget of an error occurs when you use the Skype for Business Topology Builder to Install Persistent Chat. The scenario where this error is relevant is when you have two Lync Sites and you have setup High Availability and Disaster Recovery. It just so happens this is also a Persistent chat Stretched Pool. I have spent considerable time trying to understand the underlying behavior. I hope I have gotten enough facts to help you avoid spending a bunch of hours trying to get Microsoft Support to fix it. Vs . The Deep Dive example by Richard Schwendiman. In contrast, you notice both Sites show 2 SQL mirrors. The Tech-net Documentation shows only one mirror. Channel 9 videos only show one mirror. I will now Juxtapose the Tech Net Document on the Same Design for SQL mirror setup. In these small differences, there is a bug or a limit to the software. You will be able to publish the topology Builder, with either setup. However, Since the persistent chat Principle databases is log shipping to SQL backup, the Database state of the SQL backup database with be in recovery, on a permanent basis. Since this is always recovering, the secondary mirror and witness will not be able to handle any commands from the topology Builder. you will get a failure if you try to “Publish Database” to the Secondary Site. This is by design! The Secondary settings are there, because they can be used when and if you actually do the fail-over process, to execute the Disaster recovery steps. This is the screen where you will make your setup, and because of the lack of documentation, you will not realize two of the three entries here, are not going to work as the Back Up SQL store is going to work, when you publish the topology. 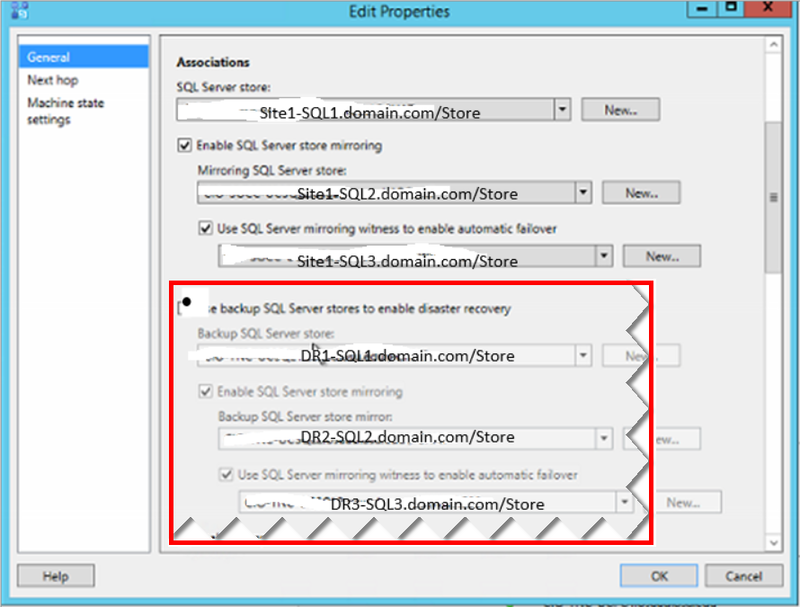 The choices In the Red square above, Are not going to be functioning, accept for the Backup SQL server Store. This is the Log shipping database, as a result of being published, the Backup database, can be the recipient of the log shipped transaction log files. Because that databases is a log shipped database, the Mirror of this and the Witness cannot be working, because the Lync Services will basically be turned off, until the Lync Services are needed. Once you fail over the Primary Database, you may then use the Mirror and the Witness defined in the Topology. Until Failover, they will lay dormant! No backup database mirroring, is this expected behavior? Basically what these two links show is that If you set up the HADR as the Figure 1 setup, with a SQL mirror at the secondary Site, That mirror will not work, based on the log ship copy of the Persistent chat Primary Database. The log shipped databases will be in recovery at all times, as it is always changing, based on the constant updates. To solidify this phenomenon, here is a Link the expresses this condition here–How to back up the secondary log shipping database. If you notice, it looks like the Always on is the solution to this problem. Hopefully this is supported for Persistent chat soon! Once you have failed over the persistent chat pool to the DR site, you may then reconnect the Pchat database, Mirror and Witness on the DR server. The gotcha is you will not be able to do it before. Automation is not built into the DR procedures. To conclude, I would really recommend you stay within the supported DR guidelines for HA ad DR with the Persistent chat pool. SFB had consolidates the steps (Over Lync 2013), so use the links above and you should be able to configure Persistent chat as a best practice. Originality will not likely pay off in this endeavor. SQL instances should both be in the same domain, as should both Sites. Configure Chat permissions – User must be a member of CsPersistentChatAdministrator. To change policy, user must be in CsUserAdministrator, at a minimum. All SQL databases need to have a domain account, with Admin permissions, common to all SQL instances involved with PCHat. The Sub-net should be on the same sub-net. There can only be one active Persistent chat primary database, at any given time, in the forest. If the SQL Server service account on your primary server runs under the local system account, you must create your backup folder on the primary server and specify a local path to that folder. to change log shipping, you have to fail over the mirror in the primary Chat Database. The only time the Second PChat Mirror is used is in conjunction with Disaster recovery. is “with an optional mirror to provide high availability during disaster recovery” The words indicate that second mirror is only used when the DR process is being manually carried out. notice it does not say SQL mirror pair in both Sites. I hope this is helpful in dispelling what Lync and Skype for Business will accept as far as the Supported HA and DR, when they are both set up and how they are set up. Move”the CMS from 2010 to 2013 (or SFB) when those databases are destroyed or Move-CsManagementServer Fails AKA How to move CMS from 2010 to 2013 when CMS is Dead. Hello and happy summer day. This article is about a subject you wont find documented around the internet much, and is not Directly Microsoft supported. With that said, I will present you with the Microsoft way and the emergency way, to save your 2013 Lync install when the 2010 has been Broken. First of all. Have Back Up. In this situation, the customer did not have a back up, but it certainly is a good Idea. So the first method you should use, if you loose your 2010 Back end Databases, is to recover them from back up. Second, Recreate your SQL server.The official documentation you will find if you loose your back end for 2010, is to Recreate the SQL 2008 server, and install an instance of SQL with the same name. From there, you can use install-CsDatabase –CentralManagementStore to recreate the Back end database on the new server. Move-CsManagementServer to move the CMS from 2010 to 2013. This process is how you might be able to move forward, eliminating your 2010, even if they are down. There needs to be said that you can forget about saving things like contacts, response groups, etc.. this is a bare knuckle procedure to get you from 2010 CMS to 2013 CMS, without loosing both installations. In this situation, you will find the 2010 and 2013 topology builder will not download the topology. You cant make any changes and the Lync control panel wont work. You are really in bad shape. What is going to save you here is a copy of your topology and the copy of your configuration. I don’t know that you can do this without a copy of your configuration so lets have you make a copy to back up now. Most of you wont have the LIS configuration and that’s ok. You will see the work around here in a second. #2 is the file we are going to recover from. keep it. #4 above is only partially successful, as we did not use any LIS configuration, so elements will fail. However, some will succeed. here is where it gets creative. Create a folder called LIS.BAK. Place an empty file inside the folder and zip it. This zip file will be required to make the next command succeed. Number 5 is your magic command. this command is able to move your CMS to 2013, without the 2010 database. This was pretty amazing. This is the steps as I recall, and this should get you moved over to 2013 for CMS. Now you will have to remove the 2010 objects to get topology published with only the 2013 Topology items being there. JUST FYI the above process only replaces step 2. So you still have work to do. However this gives you some context in to how the process fits into the whole 2010 decommission. Saggar from Microsoft Thank you for your Help!